CASA, the voice of the shipping industry, organised a seminar to coincide with World Maritime Day on 25 September at the Main Ballroom of Hotel Galadari. The seminar was titled ‘Global shipping trends and Sri Lanka’s strategy to face the future; and was endorsed by the Ministry of Ports and Shipping and Sri Lanka Ports Authority. The seminar focused on Sri Lanka’s current position in global shipping and trading, and evaluated evolving trends in the maritime and trading sectors. The key note address was delivered by the Chief Guest Sri Lanka Ports Authority Chairman Dr. Parakrama Dissanayake. City University of Hong Kong Department of Management Science Visiting Associate Professor Dr. James Jixian Wang, Hauer Associates CEO and Senior Partner S. N. Srikanth, and Maersk Line Corporate Entrepreneur Ravi Kaimal were among the eminent panel of speakers. 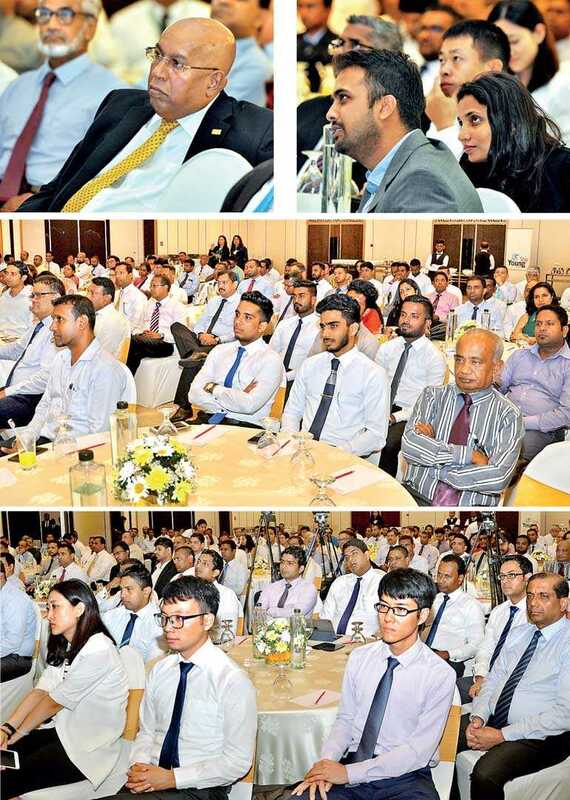 The speeches were followed by a panel discussion represented by the speakers and eminent industry professionals such as Sri Lanka Ports Authority Managing Director H D A S Premachandra, Sri Lanka Freight Forwarders Association Vice Chairman Roshan Silva, and Sri Lanka Shippers’ Council Chairman Chrisso De Mel. The panel was moderated by Daily FT Founding Editor and Chief Executive, senior journalist Nisthar Cassim. 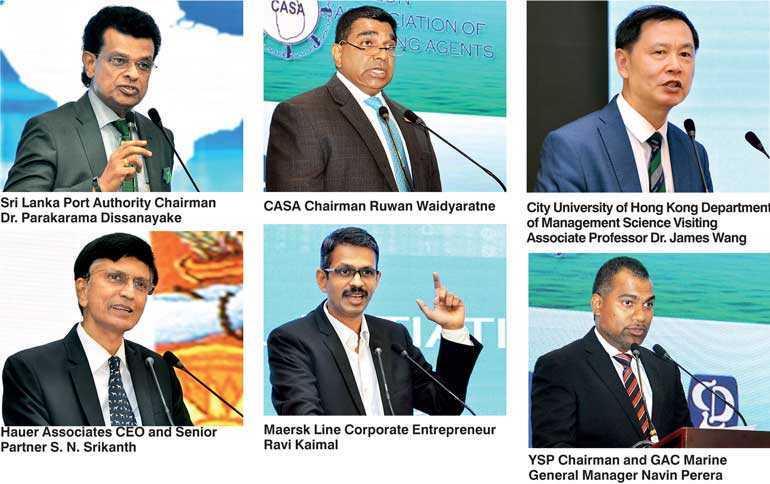 Showing CASA’s commitment in developing the next generation of the maritime industry, YoungShip was launched during the seminar, which was a landmark event in Sri Lankan maritime history. YoungShip is a professional non-profit organisation for young people working within the global maritime industry. The international YoungShip network today counts more than 3000 individual members in Norway, Cyprus, Greece, Belgium, Denmark, Singapore, England, UAE, Sweden, Finland, Italy, The Netherlands, America, Germany, Nigeria, France, Spain, and Tanzania. Speaking at the event, Patron and Past Chairman of Young Shipping Professionals and YoungShip Navin Perera revisited the objectives of the organisation, namely: to encourage interaction among industry professionals; to enhance knowledge and create industry awareness; to promote corporate social responsibility and ethical behaviour; and to increase the network internationally. He stated that they will achieve the last objective of promoting the network internationally by joining hands with YoungShip. YoungShip Chairman Hasitha Dissanayake also stated that their members will gain significantly through international exposure with this collaboration, and thanked CASA for the regular support and encouragement. Delivering the key note speech, Dr. Parakrama Dissanayake addressed the future challenges and trends in shipping. He mentioned the key achievements of Colombo Port, including being the fastest growing port and the 13th best connected port in the world. Highlighting the potential in the region, he said that India, Pakistan, and Bangladesh are among the top ten countries with the highest population in the world, with growth rates of over 25% from 2000 – 2017. While these opportunities exist, revenue per TEU and operating profit per TEU has dropped significantly, with the Shanghai Containerised Freight Index reporting a 17.6% overall drop. He also stated that the business model of outsourcing production to Asia is slowly changing to near-shoring and re-shoring, which will challenge the status quo and pose challenges to shipping lines. Quoting examples, he said that 2/3 of 384 companies operating in Europe had re-shored some activities during the past 12 months, and that nearly half of the companies plan to re-shore activities in the next 12 months. Automation and 3D printing has further reduced the dependence on labour and have made re-shoring possible. He suggested that everyone should get together in building soft infrastructure and attract more FDIs to the country, as the current outlook is not positive. He stated that India has consciously focused on improving Ease of Doing Business, and has improved their ranking from 142 in 2015 to 100 in 2018. Singapore is ranked 2nd and Hong Kong is ranked 5th, whereas Sri Lanka is ranked 111th. He emphasised that enhancing these indicators is very important to attract more FDIs. He said that Colombo Port has recorded a 19% growth in transshipment up to August this year, and stated that whether the industry is liberalised or not has not made any difference to these achievements. “While India with 1.2 billion people are recording a throughput of 15 million TEUs, Sri Lanka has 21 million people and has handled over 6 million TEUs. Therefore the problem is not with the policy framework,” he stated. Speaking of a win-win maritime partnership between Sri Lanka and India, S. N. Srikanth spoke of the opportunities that exist for both countries. Speaking of India’s ambitious Sagaramala project, he mentioned that out of the planned 572 projects, which will cost $100 billion, about 224 projects have already been awarded, and 59 projects already completed. These projects are said to unlock the potential of India’s coastline and waterways by port modernisation, new port development, port connectivity enhancement and port linked industrialisation. With relaxation of Cabotage law, foreign flag vessels are allowed to transport Laden Export Import containers for transshipment, and empty containers for repositioning between Indian ports, which will also be a favourable relaxation of regulation which will create opportunities .“However despite all these favourable changes, red tape and port infrastructure constraints pull India’s merchandise trade down,” he said. Srikanth mentioned that transhipment of domestic Indian containers would create an opportunity to Sri Lanka, as rapid economic growth places tremendous pressure on India’s road networks, imposing huge internal and external costs on society. “Growth in transport demand in India is the highest in Asia, and therefore a modal shift of Indian domestic cargo to coastal shipping is imperative. Coastal shipping becomes more cost effective compared to road transport, if external costs are figured into the equation,” he stated. He stated that India and Sri Lanka could work out a mutually beneficial agreement, with movement of domestic Indian containers being considered a coastal voyage even if they are transhipped at Colombo, and to provide competitive rates for transshipment. He also said that India will have to provide pragmatic demand side incentives, linked to reduction in external costs achieved through this modal shift. Dr. James Wang highlighted that due to the enlargement of ships, new terminals have been moving away from cities in general, which eases the container traffic within or near the cities. However, in some cases, such as Xiamen, port operations near the Central Business District become strengthened, due to some special institutional settings that favour the integrated logistics operations for international and intermodal shipments. It seems to be problematic since a large valuable piece of land is still occupied by a port, although a good alternative location is available. City governments, the authority in the national government for port development, and port authorities and operators may have different views on where to locate and develop the port, considering that the port may be an important factor for the city’s economy. Highlighting implications to Sri Lanka, Dr. Wang stated that when the Port of Colombo keeps growing, the port will be too close to the Central Business District of the city in the future, and discussed to what extent the Hambantota Port could be the ‘leap-forward’ expansion of Colombo Port. higher than the cost of physically moving it. He mentioned customers expect self-service, transparency, increased visibility, and proactive solutions at lower costs. Pointing out the current challenges in the industry, he highlighted that over 12-15 parties are involved with a shipment, which makes communication a real challenge due to different time zones and limited visibility. Using manual processes have also kept the overhead costs high. He said that the shipping industry had been very slow in embracing digitisation, which is the main reason for these challenges. However, high cost pressure/lesser margins are encouraging companies to embrace technology, which has resulted in an exponential uptake in technology in the past decade. “Many start-up companies are aggressively entering shipping and logistics as aggregators, challenging many established players in the industry,” he said. Explaining the importance of blockchain, he said that the technology will provide end-to-end real time supply chain visibility that enables all actors involved in a global shipping transaction to securely and seamlessly exchange information and documents, which will significantly improve visibility. He said it’s a string of multiparty transactions and actions that build on each other cryptographically, which can be integrated with an existing Application Program Interface. Citing examples from the industry, he stated that Maersk has digitalised the Bill of Lading (BL), which enables digital transfer of BL and related documents between all parties in the chain, where everybody gets to contribute and get visibility which ensures one version of truth. The panel discussion was successfully moderated by Senior Journalist and Daily FT Editor Nisthar Cassim, where many relevant questions were raised to the eminent panel resulting in a meaningful discussion. The panel discussion highlighted the urgency of enhancing port capacity by operationalising the East Container Terminal, and also the need to improve Ease of Doing Business and gaining investor confidence. Developing port infrastructure, strategic changes in thinking towards a more globally centred maritime operation, and radical changes in policies were discussed as necessary elements to achieve the maritime hub aspirations.